A flock of glittery birds came flying by... Vintage paper collage stars are falling from the sky... 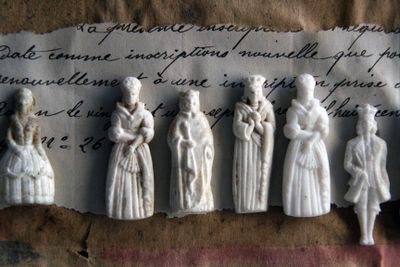 Snow birds perch on frosty limbs... And MONDAY, Quill Cottage Curiosity Shoppe begins... Tongue In Cheek has gone antique... Corey has opened an online French Brocante where she will be listing small items and delicious French ephemera! oh, i had meant to try and make some of those stars...and then totally forgot...yours are darling Miss Sandy!!! BEST of luck with your new shop!!! Beautiful creations, all,,,so nice to visit your lovely blog. Cute name Sandy. I thought about you yesterday. I put up my Christmas tree and placed the ornament you made on it. It looks lovely hanging there. I'm so excited about the shoppe! Okay, those stars are absolutely my most favorite thing I've ever seen on your blog and you know I love everything you create. They are 100% awesome! Yeah! I am so glad your shop will be up and running. Can't wait to see all the treasures. The star and bird ornaments are so beautiful! Do you end up with glitter in your hair and on your clothes? Must be very pretty by candle light. Congratulations on the shop openings too. Now, onto your paper stars. Miss Sandy! I need them. I am keeping my fingers crossed that they will magically appear in your new shop. They will be a perfect finishing touch for our little tree. so tell me, what do you use for your glue and glitter ?